Wash your plow – During the season, it’s hard to wash your snow plow after every snow event, but at the very least make sure you wash your plow before you put it away for storage. If you plow heavy salted roads and lots, then you may want to wash it more often throughout the winter to keep the corrosive salt from building up. 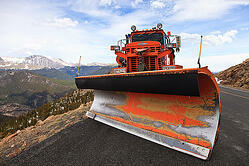 Rust Spots – Your snow plow is a work horse and it is going to get dinged up. After multiple years of use you will start to see rust locations (mainly at areas of contact). Before you store your plow for the summer check for rust. If you notice rust in any locations, wash the area, sand off the rust, and repaint. This will give the metal a protective coat while it’s in storage. Grease contact points – After each wash, before you store your plow, and before you take your plow out for the season, grease all the moving contact points. For example, the center pin (V-blade), the bolt that holds the quad and pushbeam together (straight blade), exposed chrome on straight blade cylinders, cylinder mount locations, SmartHitch pin locations, and the points where the pushbeam or A-frame connects to the coupler are some of the areas you should focus on when greasing the moving contact points. You can use a penetrating lubricating oil, like WD-40®, a low temperature silicone spray, or a low temperature lithium grease, just to name a few. Check electrical connections – Before and after each season, you should go through your electrical connections and make sure they are not corroding. If you see corrosion beginning to build up, there are steps you can take to prevent future connection issues. First, make sure there is no power going to the area you are cleaning. On the truck side, disconnect the battery, or on the plow side, disconnect the plow from the truck. Remove the plug or terminal that needs attention. If the plug or terminal is loose or broken, make sure it is replaced. If the plug or terminal appears to be in working order, then use a small wire brush to clean off the corrosion. Once you have cleaned or replaced your connectors, add dielectric grease to all terminals before plugging them back in. This step is important because dielectric grease prevents dirt, water, and salt from gathering on the connection and causing corrosion problems. Storing your plow – Your plow should be stored in a cool, dry place in the summer. A garage, pole barn, or lean-to are all adequate storage locations. In the event you cannot store your plow under a roof or on concrete, make sure when it is stored outside that it is sitting securely on blocks or 2X4’s. In all stored locations your plow should be covered; however, the cover should not be air tight. Tight covers can collect condensation underneath and can result in damage to your snow plow. Storing your controller – Your controller is also prone to corrosion and should not be left in your vehicle during the off season. All the humidity and heat during the summer months can damage your controller. Store your controller in the garage or house during the summer. Corrosion is an issue all year long. These small steps can help prevent some big problems down the road. Winter or summer, make sure your snow plow isn’t being hounded by corrosion.